Each player is then dealt four random district cards from the District Deck and each player receives two gold from the bank. The oldest player receives the Crown. 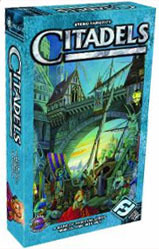 Citadels is played over a series of rounds; each round has four steps. First draw one random card from the Character Deck and set it facedown in the center of the table without looking at it. This card will not be used this round. 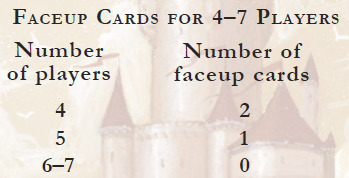 Then draw a second set of cards from the Character Deck and set them faceup in the middle of the table (the number of such faceup cards depends on the number of players). These faceup cards will not be used this round. Special Rule: If you draw the King character to be faceup, immediately replace it with another random card from the Character Deck, and then shuffle the King back into the Character Deck. 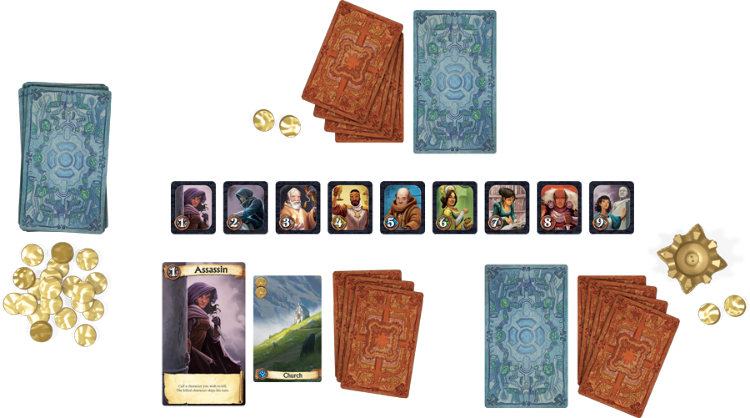 The player who currently possesses the Crown now takes the Character Deck, looks at the cards, and secretly chooses a character from those available. He then passes the remaining character cards to the player on his left, who also secretly chooses a card and passes the remaining cards to the left, etc. This process continues until each player has chosen one card from the Character Deck. After the last player has chosen, the single remaining unchosen card is placed facedown in the center of the table. 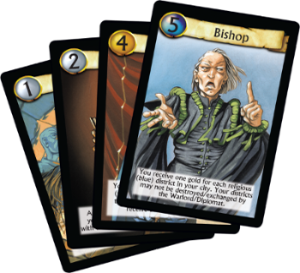 Once all players have chosen a character card, the player who has the Crown now calls out the name of each character one-at-a-time in the order of numerical rank. In this way, he first calls out the "Assassin" (#1), then the "Thief" (#2), etc. If no player reveals that character when called, simply call out the next character in rank order. When the name of your character card is called, you must reveal your character card, place it faceup in front of you, and take your turn. When your turn is over, the player with the Crown calls the name of the next character card. 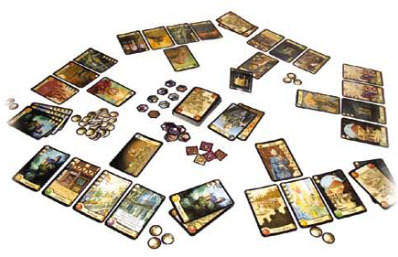 In this manner, play proceeds to every character in order of their rank number, giving all players one turn (unless murdered by the Assassin, of course). On your turn, you must first take an action, after which you may build a district card. Draw two district cards from the District Deck, choose one card to put in your hand, and place the other card on the bottom of the District Deck. After you have taken an action, you may build one district card in your city (that is, play it from your hand onto the table in front of you). In order to do so, you must pay the cost of the district, in gold, to the bank. You may choose not to build a district card if you wish. The gold cost of building a district card is equal to the number of gold coins printed on the upper left-hand side of the card. You may not build a district such that you have two identical districts (two "Castle" cards, two "Market" cards, etc). in your city. Each character has a special ability, also called its power. You may use your character's power once during your turn. Each character's special power is summarized on its respective card and explained in detail at the end of these rules. Be sure to familiarize yourself with the detailed powers before playing your first game. 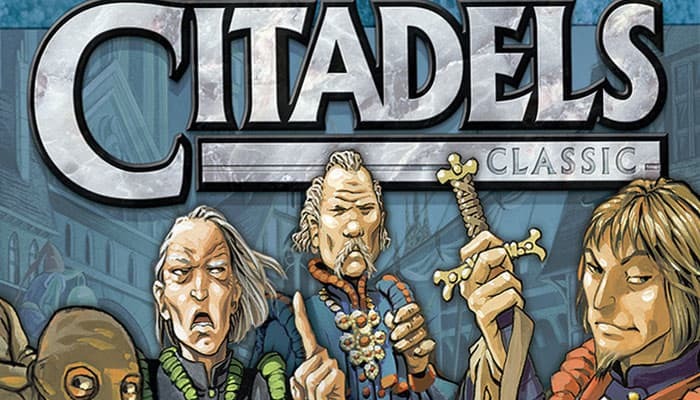 After all the characters have been called, each player returns his character card to the Character Deck, which is shuffled, and a new round begins. A player receives a number of points equal to the total combined gold cost of all the district cards in his city at the end of the game. If a player has at least one district in each of the five colors, he receives three points. If a player was the first player to build eight districts, he receives four points. All other players who have managed to build eight districts at the end of the game receive two points. The winner of the game is the player with the most points. In the case of a tie, compare the total points received only from step 1 of the above scoring process. If there is still a tie, the player with the most gold wins. Note: Players may build more than eight districts in their city if they have the means to do so.